Personal Branding: Go from Digital Zero to Social Media Hero | Leopoldina Inc.
You, my friend, are a brand. Today, your personal brand reflects the information that’s available about you on the web, mostly on social media platforms. If you google yourself, there is a good chance that you already have a digital reputation. The digital world, fueled by content marketing and social media, has propelled the concept of personal branding into the mainstream so that you no longer have to be a celebrity like Beyonce or Michael Strahan to start thinking about building your personal brand. Jeff Bezos, founder of Amazon, says “Personal brand is what people say about you when you walk out the room.” Therefore personal branding is about managing your name — even if you don’t own a business — in a world of big data. Why does developing your personal brand matter? Building a brand that perfectly captures you and your work is not always the easiest thing to do. It can take a lot of introspection, planning, and time. But, if done right, an effective personal brand can be the perfect complement to your skills and help position you as a thought leader and influencer in your industry. Define your objectives and create SMART Goals: What do you hope to achieve when people search for your name? What do you want them to see? Start by asking yourself, “What do I want to be known for?” It is important to stay true to yourself and be your authentic self. So what makes your goals SMART? 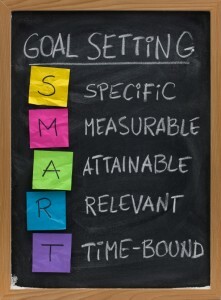 Your SMART Goals should be Specific, Measurable, Achievable, Realistic, and Time-bound. Create A Social Media Mission Statement: A brand identity should be a clear, concise narrative that defines your values and ideals. A traditional brand identity begins with a positioning statement and identifies four crucial elements: the brand’s purpose (its “why”), the ideals and values it represents, the psychographic and behavioral attributes of its target consumer and the value proposition offered by the brand to those who become identity loyalists. For example, when creating my personal brand, my positioning statement was: “Leopoldina Inc. provides art-loving/creative minded people with engaging content about the art & museum industries from a digital marketing & PR perspective. We do this by sharing our behind-the-scenes experiences in the industry and making the content visually dynamic, insightful, and helpful.” When applying a positioning statement to your personal brand, the first step is researching and understanding your online presence and reputation. Create a Consistent Look On All Platforms: All social media experts agree that it is important to create a constant brand profile across all your digital platforms. Research: The most important part of getting started on social media is to perform extensive research to understand the social media landscape you hope to enter. Who are you? What is your industry and expertise? Who are the influencers? Who is your target audience? What is the best social platform to reach them? Engagement: What drives social media is the ability to create content and engaging with your community. Therefore the key to building your brand is about building relationships. Analytics: Analyzing your social media metrics enables your brand to customize the information you share to fit your target audience. When creating your brand, it’s important to start using social media analytic tools early. Listen: It is also important to create a social listening strategy to monitor your influencers, competitors and industry to see what their communities are discussing, what they’re not discussing and filling any voids that Influencers and Competitors are not filling on social media. Leverage: Content is king and context is queen. Learning how to leverage good content is key to growing your influence and clout. One great way to leverage your brand and establish yourself as a thought leader is to create your own blog. You: it is important to be authentic and to put your voice, your personal experiences and your brand image into your social media. Step 3/ Take A Leap. Be Adventurous. Connect & stay connected: To be interesting you must stay interested. Building a great network takes time. Make it part of your daily routine and seek to expand it continuously. Leverage The Power of Storytelling. Want to learn more super tactics? Check out this social super hero resource guide and continue to follow my blog! R. Leopoldina Torres has a passion for the arts and an insatiable curiosity. Follow @rlttravels for a behind the scenes look of museums, art and culture as she shares her experiences as a museum staffer at the #HarvardArtMuseums, a New England based artist, President of the Monotype Guild of New England, and a #musesocial enthusiast. R. Leopoldina Torres concentrated in Archaeology at Harvard College, and is currently on staff in the Department of Communications at the Harvard Art Museums. She is also pursuing a degree in Marketing and Museum Studies at Harvard University, Extension School. Great content, great pictures – really enjoyed reading. Personal Branding: G… on Is Klout Still Relevant?